Originally published in the May/June 2016 Edition of ukvine Magazine. UKVINE HAS partnered with Canadian wine tasting software and data company Quini, to market its wine tasting and rating application that helps true wine enthusiasts discover their palate faster than ever before. 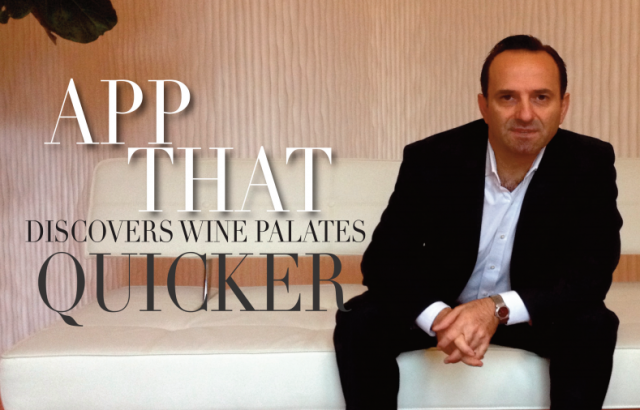 Quini’s CEO Roger Noujeim explains what the app does for the wine consumer. QUINI IS a new wine tasting and rating standard. Literally an application that helps true wine enthusiasts discover their palate faster than ever before. Long gone are the days where one needed to spend years and thousands of dollars to figure out wine and their personal preferences. In fact, Quini is the only wine app designed to expand one’s experience and knowledge of wine and wine tasting. The app is available for free download from the App Store for iPad and iPhone in English and French. There is also a Beta Android for download from our website, www.quiniwine.com. People can also use Quini on their computer by signing in on the website. Our company founders looked hard for an online platform to share wine experiences with real depth. All their efforts failed and Quini was born when they decided to create the solution themselves. The wine industry virtually everywhere faces the same issues – first helping the consumer to learn and appreciate wine, so they may enjoy wine to the fullest. But the challenge was always the lack of consistency in providing this education, and the absence of simple tools and wine language that the consumer could understand and use. So people ended up at tasting events listening to product and wine region promotions, at times taking paper notes, but only to forget most of the information later. Another issue is evolving and growing. With alternative beverage segments competing for consumer pounds, including craft beer, the wine industry has its work cut out for it and must engage consumers better than ever. Including the influential millennial groups. What we at Quini focus on is developing and giving industry professionals the tools and data they need to help consumers discover their palate faster. A consumer who understands their palate makes more accurate purchase decisions, enjoys the wine experience more, and is more likely to come back for more and encourage friends to try wine. With this positive outcome comes a major shift that stands to cause long lasting change in the industry. Once the consumer gains solid appreciation and knowledge of what they like or don’t, interaction at the store level and at restaurants will shift from the consumer being at the receiving end of a recommendation, to not settling but for what they will likely enjoy. A ‘hot promotion’ will no longer have the mass appeal it once had. This means inventory planning will evolve around consumer requirements, versus what a sales person or store manager can push. These changes will have great impact all the way back to the winery and winemaker’s choice, even the volume of the grapes they decide to plant and wines they decide to produce. How long did the Quini wine tasting app take to develop? Quini took over a year to come to life. Today has Quini expanded with an enterprise software solution for restaurants, QUINI SOMM™ (short for sommelier) that helps them maximize wine sales, enhance wine training and operational efficiencies, and improve customer experience on premise and online. Having tasted over 500 different wines in the past two years, I have reasonable understanding of wine and my palate. But the real opportunity is being in a position to help consumers figure this mysterious, complex and elusive subject called wine. And restaurants play a big role here too. By helping them standardise staff training and customer interaction about wine around the Quini 5-step wine tasting standard, before long, consumer confidence even around the most complex wine lists will be felt. And industry professionals love the application. We often end our wine tasting sessions with applause from attendees, both industry professionals and regular wine consumers. Consumers walk out with a level of confidence in themselves they never had before, and thank us for it. For industry at large, we are seeing consistent uptake but like virtually all startups face, it takes time for adoption to explode. I look forward to that day soon, as we are beginning to see the momentum build. What’s next now that you have launched your app? We will continue to enhance the user experience of the app. But the opportunity for industry with Quini today is to leverage our enterprise solutions, which is our core focus. For wineries, to leverage our growing online presence and network to maximize their brand and product exposure; longer term, to get a better grasp of consumer trends using QUINI DATA™ that is the only source for real-time wine tasting sensory data. Restaurants and wine stores can also start right now to optimise staff knowledge and consumer experience with our QUINI SOMM™ to maximize wine sales. What is your favourite wine/region? When it comes to whites, I continue to like the sweeter varieties like Moscato and blends like Albana, Chardonnay and Sauvignon Blanc. I like a good Riesling too. When it comes to reds, Touriga Nacional is my favourite varietal, followed by Merlot, Cabernet Sauvignon and Carmenere blends, or Malbec, Cabernet Franc. I like many other types but now you have my current top favourite varietals. My favourite wine regions (or rather countries) today are Canada, Italy and France, in that order. Now imagine wine consumers out there being able to spell out their preferences with this much accuracy and detail. That’s what Quini can do for wine enthusiasts who take time to record their wine impressions and building their taste profile on Quini.